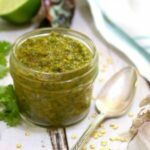 This spicy, fresh, tangy chimichurri sauce brings amazing flavor to all kinds of foods but is especially good on grilled meats. Easy enough for beginner cooks. Pulse cilantro, parsley, oregano, jalapeno, onion, garlic, lime juice, vinegar, crushed red pepper flakes, salt and pepper in a food processor until finely chopped but not pureed. Stir in olive oil and lime zest until well blended. Let stand at room temperature for at least 1 hour before using. This allows the flavors to blend and soften. Store, tightly covered, in the refrigerator for up to 2 weeks. For authentic Chimichurri sauce use 2 cups of parsley and leave out the lime and jalapeno.